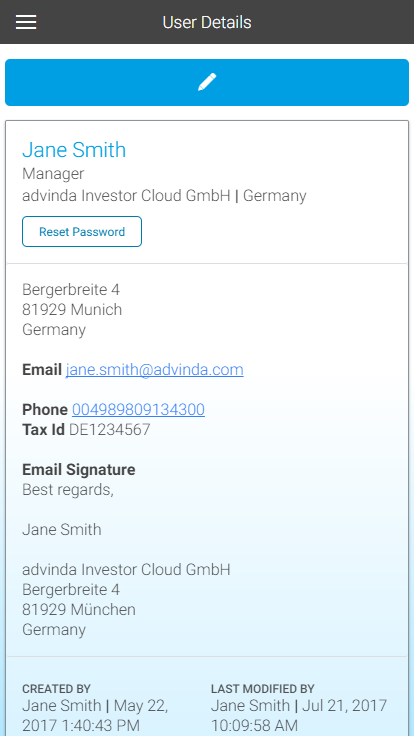 After you have completed registration with advinda, we recommend that you first of all add your email signature so that you are ready to to use the built-in email functionality. To add your signature, click the User Icon in the top right corner of the navigation bar. From the dropdown select “User Settings” , click “Edit” and scroll down to the end of the fields and add your signature information in the signature input box. Click “Save” and you are ready to send out emails. The system will add your signature automatically to all of your correspondence. You can add your own contacts to the system. Go to the Contacts page and click “New” to add a contact. If the contact is working for an account that is already in the system, you can select the account from the dropdown and the address fields will be filled automatically. 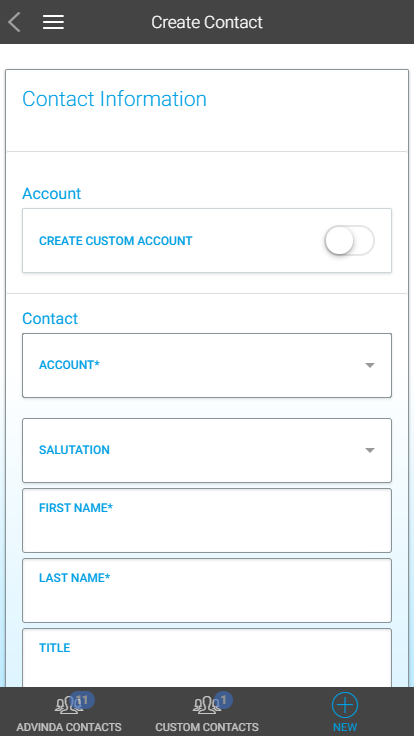 If the account to which the contact belongs, is not yet stored in the system, you can create a new account by clicking the slider “Create Custom Account” The account fields will open and you can add the necessary account information. If you only want to add a new account because you do not have the contacts yet, go to the Accounts section and click “New”. Enter the available address information and click “Save”. You can still add contacts then at a later point in time. To create a campaign, go to the campaigns page. Click “New” to create a new campaign. Individual campaigns are always country specific, you will need to select a country for your campaign. If you are raising capital in multiple countries, we recommend to create a campaign for each country. You can then combine all individual campaigns in a group. Once you have set up your campaign, you can start adding your contacts as campaign members. To add contacts to your campaign go to the Contacts page and click the “Add to Campaign” button. Select the campaign to which you would like to add your contacts. You can add one or multiple contacts at the same time. 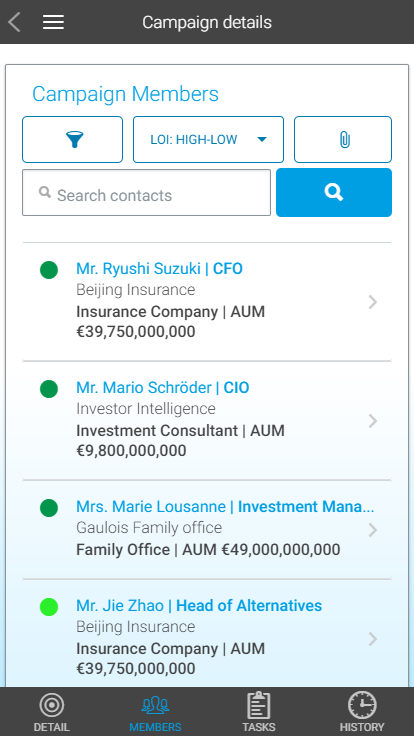 Once you have selected the contacts, click “Save” to add the contacts to your campaign. 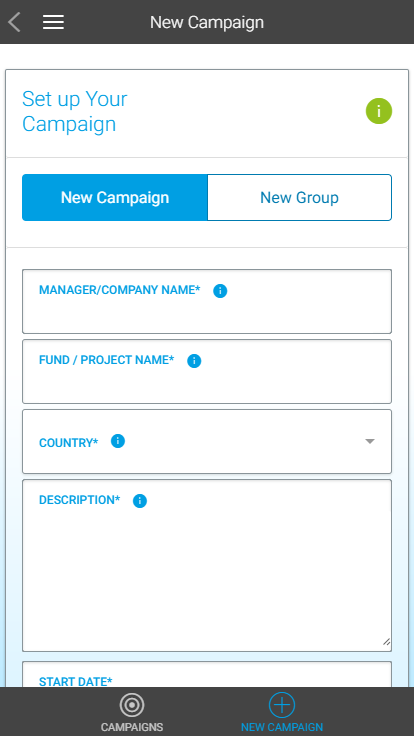 You can now keep track of all fundraising activities that are related to a specific campaign and contact. To update the status of a campaign members as you move along in the sales cycle go to the Campaigns section, click on a member’s name and edit their status or financial commitment. For more information on campaigns, visit our campaigns help section. To create a task related to a campaign, go to the campaign page and click “New“ on the Campaign Task tab. Choose a team member or yourself as the owner of the task and select the campaign member to whom the task is related. Complete the required fields and click “Save”. The task will appear under your campaign task to-do list. 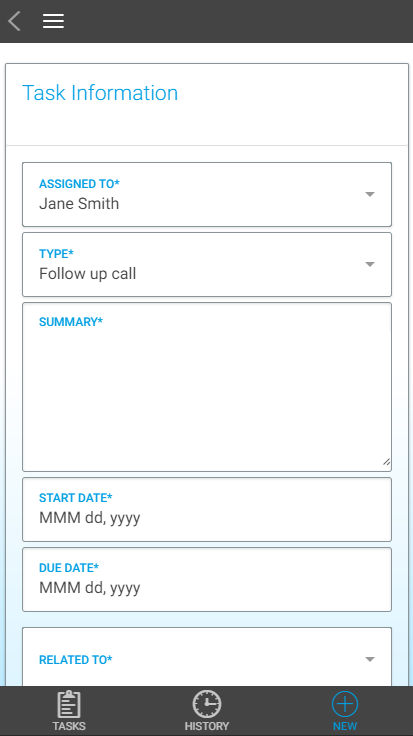 If you want to add a general task not related to a specific campaign, use the Task section to set-up the task. 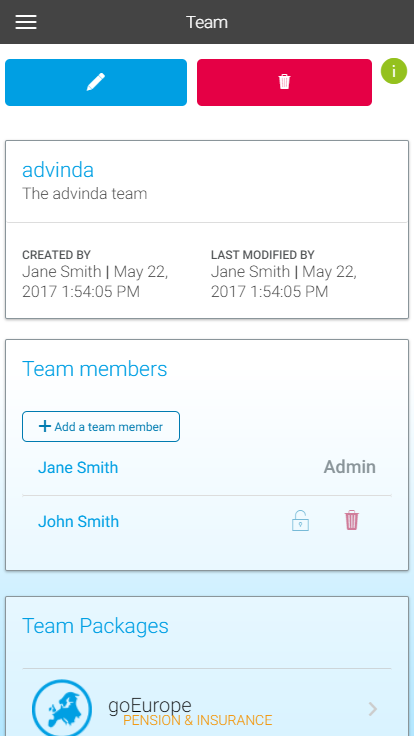 You can use advinda on your own or invite colleagues to work with you in a team. As a team you can share tasks and collaborate on a project, you gain visibility in everybody’s campaigns and the next to-dos on a campaign. As a manager, you benefit from a real-time overview on the overall campaign and sales progress by using the Dashboard. To set up a team, decide on a team admin. As designated team admin, click the User icon in the top right corner and select “Team Settings” from the dropdown. Click “Start a Team”, enter a team name and click “Save”. Now invite the other team members to your team. Click “Add Member” and enter the user’s email address. The user will receive instructions on how to join your team via email. Once the invite is accepted, the user is automatically added to the team. Please note a user can be member in one team only.